Looking across Pioneer Valley toward the Berkshires. 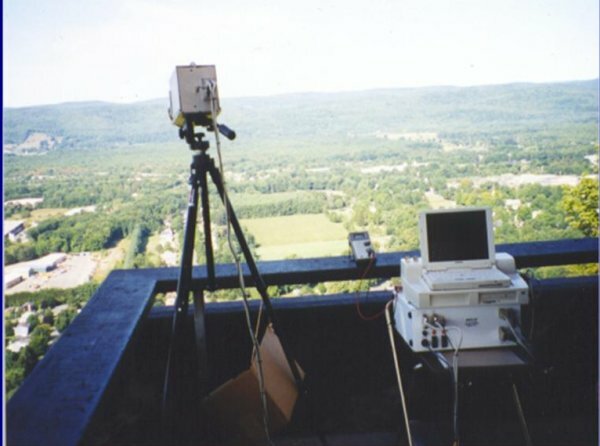 Ground (field) test program: simulation of airborne imaging capabilities. Aircraft motion is simulated by mounting the camera on an az table with CT scanning in elevation. This is called "pan-scan". Aircraft motion can be simulated by mounting the camera on an el table with CT scanning in azimuth. This is called "el-nod". Credit: Photo courtesy of Doc Ewen. "Killer" Kocinski with ROSCAM on Sugarloaf. 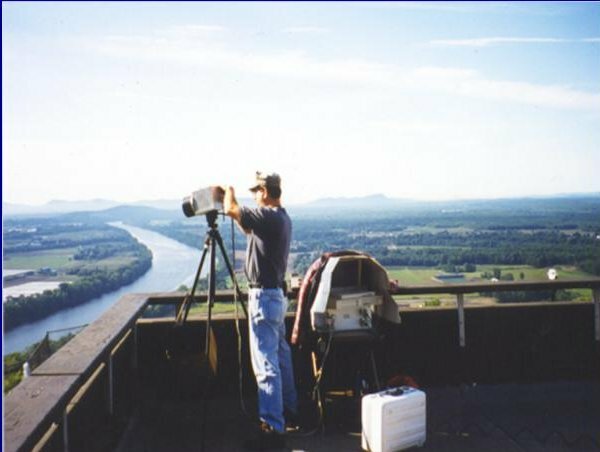 Sugarloaf Mountain (620 feet high), is a state park located in South Deerfield MA, with a view of the Connecticut River Valley, University of Massachusetts, Amherst College, and South Hampton College. Mt. Holyoke is just over the Hadley Range to the southeast, and Smith College to the southwest. Westover AFB is just beyond Mt. Holyoke at exits 5 and 6 on the Massachusetts Turnpike. The river flows south, down the middle of the valley. Credit: Photo courtesy of Doc Ewen.